Betternet is a free VPN that is simple to use, but the slow download speeds and privacy concerns make it less appealing. You can use BetterNet to give you a more secure connection when you’re using an open, public WiFi network, or to access websites and services that might normally be censored, blocked or locked from the country where you’re trying to connect from. It connects you to the internet via its own servers, protecting you from online snoopers and making it look like you’re connecting from a different IP address. This in turn conceals your identity and true location. The free version is supported by adverts, which you’ll see while browsing over the service. 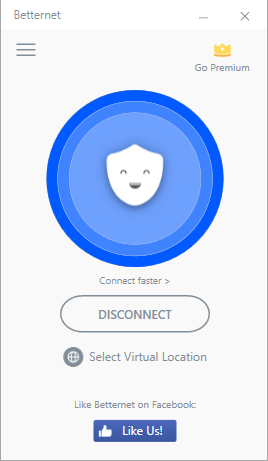 Even on the free version, you’re not limited in terms of bandwidth, so you could theoretically use it as your only VPN. The Android app, VPN Free – BetterNet Hotspot VPN and Private Browser – is one of the most popular VPN apps on the Google Play app store, though it’s not without security concerns. There’s no need to sign up for the service before using BetterNet – even premium users need to upgrade from within the app. Instead, you just download the app, install it and click the button to connect. There are barely any settings or features to configure, which keeps things simple, just a simple list of locations to connect from. BetterNet is light on features and settings. While this could be viewed as a drawback, it arguably makes BetterNet easier to use, especially for VPN first-timers. The app itself has a reasonably slick interface. The help and setup instructions are simple to follow, and installing and using the apps is straightforward enough. There’s some pushing to upgrade to the premium version, but not as much as with some other free VPNs. You can use it as much as you like without having to spend. Free VPNs rarely compete with paid-for services, but BetterNet has particular drawbacks to be aware of. There’s putting it kindly – BetterNet can be painfully slow. With no VPN, our test computer could comfortably benchmark speeds of around 35Mbps. Yet, the fastest long-distance connection we had with BetterNet enabled was just over 5Mbps – at times, this dipped to below 1Mbps. The speed issue is particularly problematic if you’re travelling abroad and wish to access US servers. 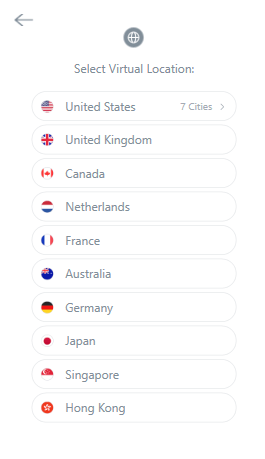 The free version of BetterNet locks you into a smaller selection of US servers, so you may not be able to use faster servers based nearer to your real location if you travel outside the States. BetterNet also collects anonymous, aggregated data about the websites its users visit and the apps they use. While this data can’t be attributed to you as a specific user, it might still give some cause for concern. The adverts you see are, BetterNet says, generic, and not in any way linked to the sites you visit or the content that you read. All the same, they can be quite annoying, interrupting your browsing experience. There have been some concerns in the past that BetterNet’s Android app includes malware. A report by Australia’s Commonwealth Scientific and Industrial Research Organisation ranked BetterNet the fourth-worst Android VPN app for malware at the start of 2017. Others have raised concerns about tracking features and leaks, so you might want to think twice before downloading. The ad-supported version of BetterNet is, of course, free. To get rid of the ads and open up the full range of servers, you need to pay $11.99 per month. That’s not tremendous value, but you can opt for a more palatable $35.98 for a full year. The concerns around BetterNet’s privacy standards, speeds and app security mean we’d hesitate to recommend paying for the premium version. You can get a superior product, such as NordVPN, Private Internet Access, or PureVPN, for a similar fee. BetterNet isn’t a great free VPN. Even though the paid-for version is good value (for an annual license) it’s a little too basic – not to mention risky – to recommend paying for. When stronger VPNs, such as Private Internet Access or PureVPN, are available at the same price or just a little more, there’s little incentive to spend on BetterNet. For a great VPN, it's worth paying a few bucks a month. PureVPN is excellent value and packed with features.